A plan by the new owners of Covent Garden Market to cut performances by buskers could lead to the end of live street shows, entertainers fear. 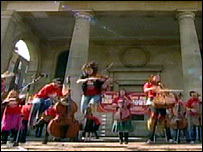 Performances of music and singing and dance have been a feature of the iconic London site for many years. Operatic star Lesley Garrett joined jugglers, singers, magicians and string quartets in a site protest on Thursday. Market owners Capco say there are no plans to stop acts but there are issues over performances clashing and noise. Evelyn Anderson, an opera singer and cellist, who represents the buskers, said Capco wants to cut 50% of their time slots, which would destroy the livelihoods of many entertainers. She said she thought the hidden agenda was ultimately to do away with the buskers completely so the shopping sites could be offered to upmarket clients. Capco said the decrease in performance slots related only to the north and south halls in the market building, which were just one part of street performance in the area. "The significant areas for complaint that are causing considerable disruption to the Covent Garden community include overlapping performances and repetitive use of material," Bev Churchil, Covent Garden's brand director, said. "We are proposing to reduce the amount of performance time so that performances do not overlap and create a 'sound clash'. "This will draw more people to the individual performances rather than dividing the audience between two simultaneous acts. "We are also introducing regular breaks so that there are parts of the day where the wider community can have a break from music. "We support street performance in the area and see it as a fundamental part of the history and the future of Covent Garden."